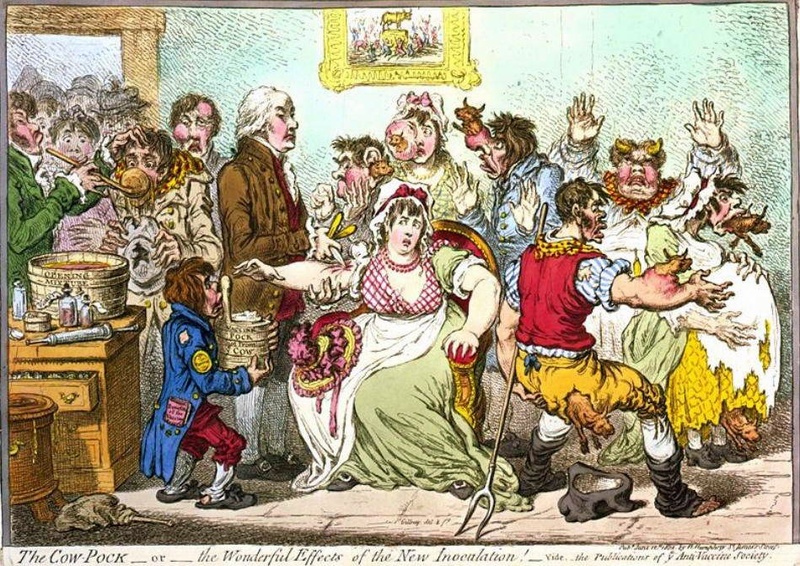 Caricature by the English artist James Gillray: The Cow-Pock or the Wonderful Effects of the New Inoculation! 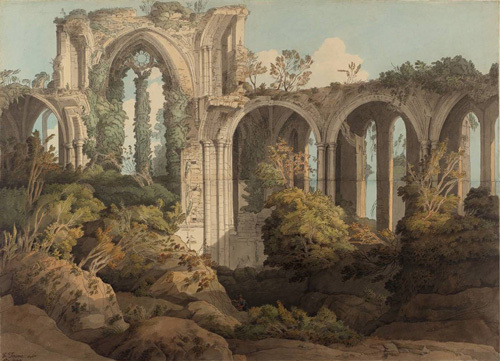 (1802). The word ‘vaccination’ comes from the Latin ‘vaccha’ for cow. Jenner’s treatment did not use the live smallpox virus but the virus from the milder cow pox which also produced immunity in humans. The Red and the Scarlet is set at a similar pivot, the dawn of the age of enlightenment. Doctors were beginning to distrust a system of medicine based on the humours, which had guided medical practice for centuries. Treatments compromised survival among the rich (read Sir Charles Scarborough’s account of the death of Charles II) and more enlightened physicians were studying folklores to find new cures. If the enjoyment of the Gothic comes from an acting out of irrational fears in a safe environment, smallpox offers the perfect subject. It is the only human disease ever to be completely eradicated from the world’s population and yet, despite advances in modern medicine, the horror of sickness, of things erupting from the body, of disfigurement and pain still grips us. The Gothic tradition is continually evolving: Emily and Charlotte Brontë pitted a new type of damsel in distress, one that rises victorious from male oppression: the feisty Cathy in Wuthering Heights and the strong, intelligent Jane Eyre. In this century, Stephanie Meyer repackaged the genre in the form of vampire Edward Cullen, an ‘Edward Rochester with fangs,’ according to clinical psychologist Dr Cecilia d’ Felice. Cullen is a man who threatens the heroine but also arouses feelings of sympathy, a longing to heal his wounded heart. D’ Felice believes that at that same time as harbouring these more lofty emotions, the teenage girl subconsciously wants to be chased and caught, absolved of the responsibility of controlling her desires. Literary critics may be snobbish about the Gothic genre but it remains perennially popular with well respected authors creating gripping narratives within it: Henry James’ The Turn of the Screw (1898), Daphne du Maurier’s Rebecca (1938), Angela Carter’s The Bloody Chamber (1979) and Sarah Water’s The Little Stranger (2009).